Sigh, July somehow gobbled up my momentum from my time spent at the University of British Columbia in June, even with the fun of rebooting the old CAREO service in Brian Lamb’s [old] office. 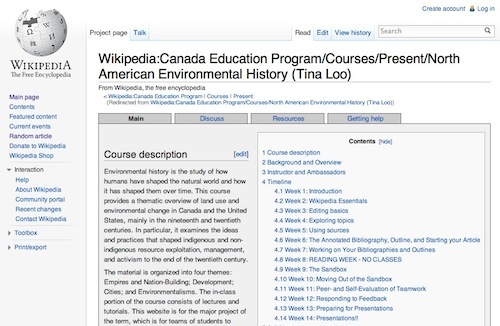 But as follow-up to my interview with UBC History professor Tina Loo I had also interviewed three of her students to get their perspective on the Wikipedia Education Program (WEP) project they did in Tina’s North American Environmental History class. It’s time I get these published! To recap, the Wikipedia Education Program is designed to provide a structure and support for teachers who have their students work on writing/improving Wikipedia articles. The Wikipedia Education Program’s vision is to mobilize and empower the next generation of human-knowledge generators to contribute to Wikimedia projects. Based on the learnings from the Public Policy Initiative, a pilot program to use Wikipedia in university classrooms in the 2010″“11 academic year, the Wikipedia Education Program strives to expand Wikipedia’s use as a teaching tool worldwide. Professors who participate in our program assign their students to edit Wikipedia articles as part of their coursework. Students are assisted by trained Wikipedia Ambassadors, who help both in the class and on wiki. You can get a quick introduction to how the program is structured at Wikipedia Education Program/A-Z. Additional resources are available at the Education portal. I appreciate the opportunity to chat with three articulate students, two by Skype and one I met on campus. They all described how the writing process (and goal) was so much different from their typical assigned research writing essays, the impact of writing for a lay public, and how they were opened up to both the encyclopedia form of Wikipedia and the community aspect that often resides un-seen behind the articles. Before this experience, all of the students were familiar with Wikipedia (one had some experience doing minor editing), as well as the prevalent attitude that it was not to ever used as a cited source… “we were told “don’t ever use it, don’t ever cite it”- their more liberal professors might suggest it is okay to review the first few paragraphs of an article or use the references. It was apparent that these students are deluged with essay writing in their undergraduate education- “When you are in your fourth year of university you have written so many essays” and they welcomed the opportunity to write in a different way. [This] Writing was really practical because it was meant to be written so anyone can understand it. You cannot assume the audience knows meaning of all the terms. You got good at writing what I meant in a shorter space; in essays, I often find I am looking to expand all the time, make myself lengthier, longer, and more in depth. In this literally we are taking hundreds of pages of research and make a 500 word piece of work about it that a general population can understand. It took so much work, but it made my writing become more explicit and to the point. Keep in mind that you were very much writing for laymen, compared to other papers where you would be more inclined just to throw in words you would assume the professor would know. And another student reported only helpful input with photo help and minor grammar suggestions from the Wikipedia community. One of the biggest motivating factors to these students was knowing their writing is public. It’s an interesting experience to be writing something that thousands, maybe millions of people might read; with your essays that you hand in, half the people do not even pick theirs up. I was a lot more conscientious of my writing. [There was a] huge emphasis on rechecking everything five times and trying to find an extra source if you can, just because the fact that people will actually read it rather than just a professor marking it. Really for me it created this need for security that I was getting even the most basic of facts correct. The fact I was rechecking the facts would not have even happened to begin with on an essay. And finally, with some comments on the overall experience and why perhaps other teachers should consider the program. I look at Wikipedia differently. I have found an article on an author that was blatantly wrong. Now I know to change it- that first edit was terrifying. Deleting someone else’s writing and put my own in place of it? I was actively worried. Now that I know how to edit, I know that I can. The more we got involved into it, the more it seemed like we were using our education to actively help the world. Often the university feels so closed, so elite. It’s really empowering to students to do something that is contributing to a public base of knowledge. For me especially, it made me work harder because I knew it was going to be read by so many people, so I almost surprised myself for my work ethic in this course. Usually its pretty good, but in this course it was really good, it really motivated me. The reality is that Wikipedia really is becoming a basic source of information, not the thing you are going to write your whole paper with, but people go to it– even my grandmother goes to Wikipedia as a reference. A basic fact. Being able to edit this thing is valuable, contributing to it, making it more robust is a positive contribution to the world. And a good way to channel your student’s energy. Taking it outside the rigid realm of “this is the term paper”, the standard rubric of how a class goes, it engages students in an era where the Internet is everything. We use it day in and day out to research, for social media- to integrate this into a class format gives it more importance. These of course are selected students out of a larger group, but the conversations with them gave me a lot of interest to the potential of this project, both from the greater understanding of Wikipedia itself, to a new appreciation for public writing, and doing research and writing for in a format not typically done in higher education. I want to thank Tina again for taking the time to talk to me about her project and to introduce me to Alex, Heather, and Drummond, who I also need to thank for sharing their feedback. It would seem that the Wikipedia Education Program is a formalized version of the effort made by UBC’s Jon Beasley Murray’s so impressive run with “Murder, Madness, and Mayhem” — it appears to be a well structured, but significant effort to take on, not just something one lops in top of a syllabus. And it is much more than the mechanics of wiki editing. The support offered by Wikipedia seems, from the people I spoke to, appears to be invaluable.